Central identity management solutions like IPA offer a very nice capability – in addition to storing users and groups on the server, also certain kinds of policies can be defined in one place and used by all the machines in the domain. Sudo rules are one of the most common policies that administrators define for their domain in place of distributing or worse, hand-editing /etc/sudoers. But what if the administrator would take advantage of the central management of sudo rules, but apply these sudo rules to a user who is not part of the domain, but only exists in the traditional UNIX files, like /etc/passwd? This blog post illustrates several strategies for achieving that. This might be the easiest solution from the point of view of policy management that allows you to really keep everything in one place. But it might not be always possible to move the user. A common issue arises with UIDs and file ownership. If the UIDs are somewhat consistent on majority of hosts, perhaps it would be possible to use the ID views feature of IPA to present the UID a particular system expects. If it’s not feasible to move the user to the IPA domain, there are other options to consider. One of the core design principles of SSSD is that a user and its policies must both be served from SSSD and even from the same SSSD domain. This prevents unexpected results in case of overlapping user names between SSSD domains or between the data SSSD is handling and the rest of the system. But at the same time, local users are by definition anchored in /etc/passwd. To be able to serve the local users (and more, for example better performance), SSSD ships a files data provider since its 1.15 release. At the moment (as of 1.16.1), the files release mostly mirrors the contents of /etc/passwd and /etc/groups and presents them via the SSSD interfaces. And that’s precisely what is needed to be able to serve the sudo rules as well. Let’s consider an example. A client is enrolled in an IPA domain and there is a user called lcluser on the client. We want to let the user run sudo less to be able to display the contents of any file on the client. Note that we lcluser doesn’t exist in IPA, yet we were able to add the user with the regular sudorule-add-user command. When we inspect the sudo rule, we can see that IPA detected that the user is external to its directory and created a special attribute externalUser where the username was added to, unlike the IPA user admin, which is linked to its LDAP object. The reason it is preferable to use the IPA sudo provider over the LDAP provider is that the LDAP provider relies on schema conversion on the IPA server from IPA’s own schema into the schema normally used when storing sudo rules in LDAP as described in man sudoers.ldap. This conversion is done by the slapi-nis plugin and can be somewhat costly in large environments. Using the files provider is preferable, because it actively watches the changes to /etc/passwd and group using inotify, so the provider receives any change done to the files instantly. The proxy provider reaches out to the files as if it were a generic data source. Also, as you can see, the configuration is not as nice, but it’s a valid option for older releases. If using SSSD is not an option at all, because perhaps you are configuring a non-Linux client, you can still point sudo to the IPA LDAP server manually. I’m not going to go into details, because the setup is nicely described in “man sudoers.ldap”. Unlike all the above options, this doesn’t give you any caching, though. One of the frequent requests we receive for a future enhancement for the SSSD project is one where admins would like to restrict the list of groups users on a host are a member of. We currently don’t offer this functionality and in this blog post I would like to explain why it’s not a completely trivial thing to implement correctly (and therefore why it’s not implemented already..) and offer a workaround that can be used for many environments as long as the administrator understands its limitations. The vast majority of administrators are actually asking to improve performance, especially in High Performance Computing environments where users are part of a huge domain, but the client machine is only interested in a subset of the groups that give access to some resource. At the same time, avoiding the group resolution completely is significantly less trivial than the first case where SSSD would resolve all the groups and then only present a subset to the system. Resolving the list of groups the user is a member of is a complex task, which can query different resources or interfaces depending on how the user logs in or what kind of command the administrator invokes. In the simplest case, where SSSD is connected to a generic LDAP server and the admin calls the “id” utility, SSSD would search the LDAP directory for groups the user is a member of. This scenario is actually possible to restrict already (and we’ll show how later in the post), but there are more ways to resolve a user’s group memberships. For example, in an Active Directory domain, the group membership might come from the PAC data blob attached to the Kerberos ticket acquired during authentication in the form of a list of SIDs which must be resolved into either a POSIX ID or a name before to be filtered later – and this SID-to-name/SID-to-ID resolution would negate any performance benefit in most cases. Similarly, when an IPA client is resolving groups for an AD user from a trusted directory, it would ask one of the IPA masters for a list of groups the user belongs to. These two examples hopefully illustrate that there are many code paths to consider to make this feature work as expected in all possible scenarios. While implementing this feature is something we have on our roadmap, it will take time to get there. Let’s say that in our environment, we only care about the “sudogroup” so that the user can elevate her privileges with sudo and the “Domain Users” group to access shared resources. Please note that the group search base is not required to be set unless in the typical case, because SSSD infers its value from the domain name of the AD domain it is joined to. This lookup only includes the domain users group and the sudogroup. Inspecting the SSSD debug logs would show that the client only attempted to fetch group names that include the “domain users” or the “sudogroup”. 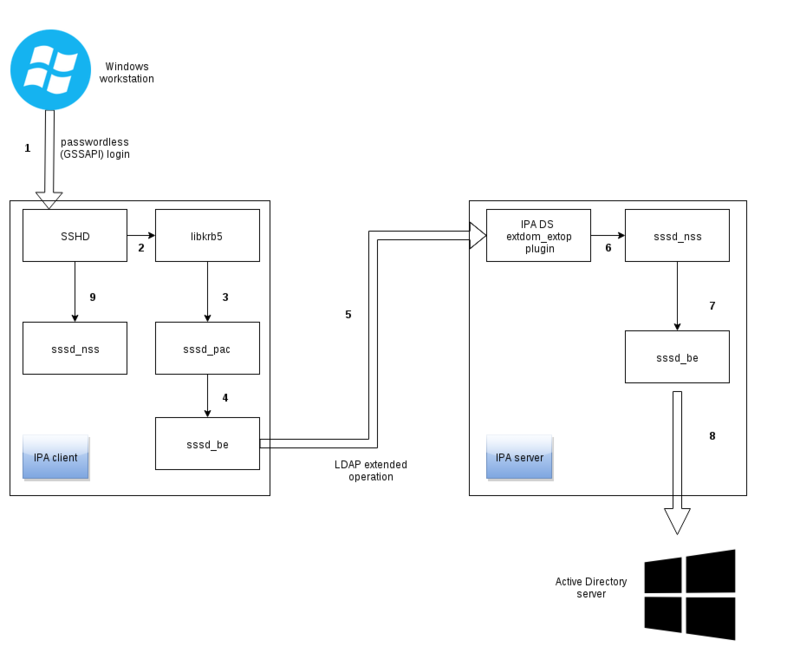 This configuration workaround would work only if the client lookups the entries in an LDAP tree directly – so it wouldn’t work in cases where an IPA client is looking up groups of a user who comes from a trusted AD domain or in the case where the user logs in without a password using her Kerberos ticket from a Windows machine and expects SSSD to read the group memberships from the PAC blob attached to the Kerberos ticket. Similarly, this workaround only works for the joined domain, because at the moment (at least until the trusted domains can be made configurable), the trusted domains only use the default search base. These cases will be covered when the upstream ticket https://fedorahosted.org/sssd/ticket/3249 is implemented in one of the future SSSD releases. We also believe that, since this feature is often asked for performance reasons, we should focus on improving SSSD performance in the general case instead of providing workarounds. FreeIPA is an open source identity management software. One of the nice features is the ability to limit which users can log in to which servers using Host Based Access Control (HBAC). Previously, only SSSD was able to parse and evaluate the HBAC rules – however, some users run operating systems that either do not support SSSD at all, or SSSD can only be configured in a way that doesn’t include the HBAC engine. To provide HBAC support for these platforms, we wrote a new PAM module called pam_hbac. The first release of pam_hbac just happened and in this blog post we would like to introduce the project and show how it works. pam_hbac connects to an IPA server, downloads the HBAC access control rules, evaluates them and decides whether access should be allowed or denied. Even though pam_hbac is a project on its own, it uses the same code to evaluate the HBAC rules as SSSD does, so the resulting access control decision will be the same for the same rules provided the input is the same as well. Using pam_hbac should come with a disclaimer – if your operating system supports SSSD and you can use its IPA id_provider, please use SSSD instead of pam_hbac. SSSD is maintained by a large team of developers, it is included in distributions with commercial support available and has several advantages over pam_hbac, including offline caching or Kerberos authentication using the host keytab by default. if your IPA client runs an OS that does support SSSD but not its IPA provider. At the moment, this is the case with Amazon’s Linux distribution and also FreeBSD. if your IPA client runs an OS that supports the IPA provider, but the IPA provider lacks the support for users from trusted Active Directory domains. This is the case for clients running RHEL-5 and leveraging the “compat” LDAP tree provided by the slapi-nis plugin of IPA. Development of pam_hbac happens on github. There you can clone the git repository and compile pam_hbac yourself. Because the required dependencies or configure flags differ for each platform a bit, please refer to per-platform README files in the doc directory. As an example, there is a FreeBSD-specific README file that contains step-by-step instructions for building and installing pam_hbac on FreeBSD. For RHEL-5 and RHEL-6, we have also provided a COPR repository with prebuilt binaries. On these platforms, you can just drop the .repo file into /etc/yum.repos.d/ and then yum install pam_hbac. We would certainly welcome contributors who would like to provide prebuilt binaries for different platforms! In the rest of the blog posts, we illustrate two examples of pam_hbac in action. One would be using pam_hbac on FreeBSD to grant access to a subset of IPA users and another one would be to use pam_hbac on CentOS-5 to restrict access to a single Active Directory group in a setup with trusts. For both examples, we use the same environment – the IPA domain is called IPA.TEST and is managed by an IPA server called unidirect.ipa.test. Our clients are called freebsd.ipa.test and centos5.ipa.test. Even though the recent FreeBSD releases do ship SSSD, it is not built with the IPA provider by default (only through extra flags) and therefore HBAC enforcement might not be available easily. However, we can configure SSSD with the LDAP id_provider or just nss-pam-ldapd on FreeBSD and use pam_hbac for access control separately. The next step is to install and configure and pam_hbac. Because at the moment there are no prebuilt binary packages for FreeBSD, you’ll need to compile the module from source. The steps are documented in the FreeBSD README in pam_hbac’s git repo . After configuring the source tree, building and installing pam_hbac, you’ll end up with the module installed to /usr/local/lib/pam_hbac.so. Finally, we can disable the allow_all rule on the server and instead only allow access to bsduser to the freebsd.ipa.test machine. Please don’t forget to add other rules in your test environment so that you can at least access your IPA masters! One important use-case for pam_hbac is to provide access control for setups that resolve users from a trusted AD domain using the ‘legacy client’ setup in which a CentOS-5 machine is set up with id_provider=ldap pointing to the IPA server’s compat tree. Please note that if your IPA domain doesn’t have a trust relationship established with an AD domain, you can already use HBAC provided by SSSD and you don’t need pam_hbac at all in that case. OK, the id output reports the user is a member of the ipa_linux_admins group, so we can proceed with setting up the HBAC rules. Enabling the rule would allow access again. Of course, don’t forget to allow access to your IPA servers and clients with other services and for other users as appropriate! As the final step on the server, we can define the HBAC rule for our particular CentOS-5 machine. While the access was already checked against the system-auth rule on the server, that rule cannot discriminate between different hosts and applies to all authentication requests coming from the slapi-nis plugin. Please note that the a bind user must be configured, refer to the BSD example for details. Now we’re ready to configure the CentOS-5 client. Make sure pam_hbac is installed first – you can use our COPR repository for that. Just drop the repo file to /etc/yum.repos.d and then yum install pam_hbac. The file is located at /etc/pam_hbac.conf. You can see I also added the pam_localuser.so module just before the line with pam_hbac.so. Adding the pam_localuser.so module ensures that pam_hbac wouldn’t be called for local users defined in /etc/passwd – we only want the HBAC policies to apply to IPA and AD users. Awesome, now even your CentOS-5 server enforces HBAC rules! May 25 22:48:47 centos5 su: pam_hbac(su-l:account): ALLOWED by rule [centos5-ipa-linux-admins]. The full debug output breaks down all the rules into their components and shows what matched and what did not. This blog post described the first version of pam_hbac. We will continue the development to add more supported platforms – in the next version, we would like to add support for IBM AIX and Apple OS-X. There are also several bugs and minor enhancements we would like to add. Feel free to file an issue on github if there is something you would like to see improved or something doesn’t work for you! I’ve been recently working on making SSSD perform better in large environments, that contain thousands of users or groups. And because two of the types of setup I wanted to test were SSSD directly enrolled into an Active Directory domain and SSSD as a client of an IPA server that trusts an Active Directory domain, I needed to create a large Active Directory environment for testing. Of course I didn’t want to create the users in the AD Users and Groups GUI snap-in one by one. And I preferred to create the users and groups from the Linux command line, because that’s what I’m familiar with. After some tinkering, I realized the adcli command already does exactly what I need to with its “create-user”, “create-group” and “add-member” commands. By default, adcli would ask you for the AD Administrator, but using a Kerberos ccache is as simple as adding the “-c” option. Of course, adcli does much more than just creating user or group object in Active Directory. adcli is a powerful command-line tool for performing actions on an Active Directory domain. You probably used it already without realizing if you ever added an Active Directory client with realmd, because realmd uses adcli internally. In particular, it would use the “adcli join” command. On RHEL-6, adcli is available already in EPEL and will be available in RHEL-6.8 as a regular RHEL package. In RHEL-7 and supported Fedora distributions, both realmd and adcli are already available in repositories. In most cases, using the SSSD is all about connecting a client machine to a central user database, like FreeIPA or Active Directory precisely because you want all users on all machines across the domain to have exactly the same properties. However, even though it would be best to centralize all the things, there will always be exceptions. There can be an odd legacy server where a particular user has a UID set to a value that predates the migration to a central domain controller. Or you might administer a machine where a user stores her files in a different home directory than any other machines. If the client is a member of an FreeIPA domain, you can just define an “ID view” and define the custom values centrally on the IPA server. Using ID views is the recommended way of setting any overriden attributes – however, not all environments use a FreeIPA server..
To solve those use-cases, the SSSD provides a command-line tool that allows the administrator to set one or more POSIX attributes to a different value on that particular system. The tool is called sss_override and is part of the sssd-tools package since version 1.13.1. Running sss_override --help would present the user with a list of available sub-commands. We’ll show some examples of using them later in this text. Please note that the local overrides can not be used in combination with IPA provider. Instead, the server side overrides can be defined directly through IPA web or command line interface. One very important aspect to keep in mind is that the overrides are stored in the cache, along with the data from the directory server. This conflicts with a very commonly used practice among admins who often remove the database and try to start from a clean cache when they encounter any problems with sssd. Therefore it is necessary to manually export the override data prior deleting the cache and import them again later, otherwise the override data would be lost! SSSD needs to be restarted for the changes to take effect. As the info message tells us, currently SSSD needs to be restarted when the first override is added in order for the overriden values to take effect. All subsequent overrides will take effect immediately. To see what overrides are actually configured on the system, you can use sss_override commands user-find, user-show, group-find and group-show. The local overrides are a powerful mechanism to deal with irregularities in an otherwise centralized environment. That said, using a completely centralized solution, like IPA’s idviews feature avoids issues with keeping the overrides in the cache itself as well as provides a unified view of all overrides in the UI. As an incremental improvement, the SSSD team is looking into ways of making the import and export more automated so that the danger of removing the database is mitigated by the SSSD tools. This blog post describes several sssd.conf options that are available for performance tuning of SSSD, especially focusing on deployment of an IPA server with trust established with an AD server. Some of the options are useful for other scenarios as well, but it should be noted that diverting from the defaults is something that needs understanding of the implication the change has. This post is also written with SSSD version 1.12 and 1.13 in mind – later versions might have different tunables available or might not need these at all as we continuously improve performance. The typical use-case this post is trying to address is “a login to my IPA client using AD users and his AD credentials is way too slow”. Later in the article, we’ll be setting several options in the IPA server’s sssd.conf. That might be confusing if you’re not familiar with the architecture of the IPA-AD trust lookups and authentication data flow – so let’s illustrate it briefly. The two basic requests type the client can perform are identity lookups and authentication. For IPA users, the identity lookups are normal LDAP searches against the IPA server and authentication is performed using an internal kinit-like tool also connecting to the IPA server. Trusted AD users work differently — the identity lookups from the client machines connect to the IPA server using an LDAP extended operation. The IPA server’s extdom plugin queries the SSSD instance running on the server for the AD user information, the SSSD instance runs a search against the Active Directory server using the LDAP protocol and passes the data back to the IPA client. For password-based authentication requests, the IPA clients connect directly to the AD servers using Kerberos. The Kerberos tickets of Active Directory users have a blob attached to them, called MS-PAC (a privilege attribute certificate, see https://msdn.microsoft.com/en-us/library/cc237917.aspx for details of the specification). The MS-PAC (or just PAC going forward) contains the complete and precise list of group memberships at the time user logged in into the Active Directory domain, signed by the domain controller. It is actually the mechanism Windows clients use to set list of the groups the user is a member of. If there is a PAC present, then a special libkrb5 plugin invokes the sssd_pac responder. The sssd_pac responder parses the group memberships from the PAC blob during login. This processing needs to resolve internal identifiers of groups in Active Directory (SIDs) to their names and POSIX IDs because Linux cannot yet deal with SIDs natively. For each SID identifier that is not stored in cache yet, the sssd_pac process asks the sssd_be process to translate the SID into a name and/or GID. The sssd_be process calls an LDAP extended operation towards the IPA server, asking for information about a particular SID. The sssd_be process on the server searches the Active Directory server’s LDAP store for the corresponding LDAP objects and stores them into the cache. When the object is stored, the flow reverses – the sssd_be process on the server tells the sssd_nss process the cache is up-to-date. The sssd_nss process returns data to the DS plugin on the server, which in turn returns data in the extdom-extop operation reply to the client. Finally, all the groups from the PAC object are processed. When the SSH daemon on the client opens the session for the user, it would call the initgroups() function to set up group memberships. When this function’s equivalent reaches the sssd_nss responder, all the data would be cached from processing the PAC blob and returned from the SSSD cache. Please note that for simplicity, this diagram omits additional actions that might happen during login, such as HBAC access control or setting the SELinux label for the user. If password-based authentication is used, the data flow is quite similar, except the sssd_pac responder is not involved until later in the process when the ticket is acquired on the IPA client itself. With identity lookup (for example id aduser@ad_domain), the PAC responder is not invoked at all, but all lookups are driven completely by the sssd_nss responder. But even here, the general flow between IPA client and IPA server is the same. Also keep in mind that retrieving members of trusted groups or retrieving user groups prior to login requires RHEL-7.1 or RHEL-6.7 packages on the client side. Additionally, the IPA server must be running RHEL-7.1 or newer at the same time. Not all IPA masters are capable to resolve AD users this way. In FreeIPA < 4.2, only IPA masters where ipa-adtrust-install command was executed can retrieve information from Active Directory domain controllers. Such IPA masters were also used for establishing actuall cross-forest trust to Active Directory and AD domain controllers were talking back to IPA masters as part of that flow. With FreeIPA 4.2 a concept of ‘AD trust agents’ was introduced that allows other IPA masters to resolve AD users and groups without the need to configure them as a full domain controller. [ipa_s2n_exop_done] (0x0040): ldap_extended_operation result: Operations error(1), Failed to handle the request. [ipa_s2n_get_user_done] (0x0040): s2n exop request failed. The most data-intensive operation is usually retrieving the information about user’s groups on the server side. If the group objects are not cached yet, that operation can amount to downloading a large amount of data, storing it in server’s sssd cache, transferring the data to clients and storing them again in client’s sssd cache. Subsequent lookups for the same LDAP objects, even from another client instance would then just read the objects from the server side sssd’s cache, eliminating the server side costs, but the very first search might be costly in a huge environment. Now that we know how the flow works, we can start optimizing it. Because the heavy lifting of the lookups is done on the server side, the changes in server’s sssd.conf also have the biggest impact on the lookups performance. The following options should be added to the /etc/sssd/sssd.conf file on the IPA masters. Normally the most data-intensive operation is downloading the groups including their members. Usually, we are interested in what groups a user is a member of (id aduser@ad_domain) as the initial step rather than what members do specific groups include (getent group adgroup@ad_domain). Setting the ignore_group_members option to True makes all groups appear as empty, thus downloading only information about the group objects themselves and not their members, providing a significant performance boost. Please note that id aduser@ad_domain would still return all the correct groups! Minimal version: For users from IPA domain, this option was introduced in sssd-1.10. However, it’s only possible to use it for trusted domain users via the subdomain_inherit option (see below). SSSD 1.12.x runs a cache cleanup operation on startup and then periodically. The cache cleanup operation removes cached entries that were not used for a while to make sure the cache doesn’t grow too large. But since SSSD can also operate in offline mode, we must be very conservative about what is removed, otherwise we might lock out user’s access to a file. At the same time, searching the cache and examining the entry could take a lot of CPU time. Therefore, the cache cleanup operation was of limited use and was disabled by default in 1.13. You can disable it in previous versions with a config change as well. Minimal SSSD version: All supported SSSD versions have this option. Cons: the cache can grow in size. The options above can be passed to the trusted AD domains’ configuration. At the moment, the only supported method is using the subdomain_inherit option in the sssd.conf‘s domain section. Any of the two options’ names from above can be listed as a value of subdomain_inherit and they will apply to both the main (IPA) domain as well as the AD subdomain. In the future, we would prefer to add support for sub-sections in sssd.conf, but we’re not there yet.. The complete list of options that can be inherited by a subdomain is listed in the sssd.conf manual page. Miminal version: Upstream 1.12.5. However, this option has been backported to both RHEL-6.7 and also RHEL-7.1 updates. Pros-Cons: N/A, this is just a control option to extend influence of the options above to domains from a trusted AD forest. Please tune the size parameter according to your IPA and AD directory size. As a rule of thumb, you can use 100MBs per 10000 LDAP entries. Doing this change on the IPA server is a bit safer than IPA clients, because the SSSD instance on the server will never lose connectivity to the IPA server, so the cache can always be rebuilt. But in case the cache was lost after a reboot and the AD server was not reachable due to a network error or a similar condition, the node would not be able to fall back to cached data about AD users. Pros: I/O operations on the cache are much faster. Cons: The cache does not persist across reboots. Practically, this means the cache must be rebuilt after machine reboot, but also that cached password are lost after a reboot. The following options should be added to /etc/sssd/sssd.conf on the IPA clients. On a Linux system, user group membership is set for processes during login time. Therefore, during PAM conversation, SSSD has to prefer precision over speed and contact the server for accurate information. However, a single login can span over multiple PAM requests as PAM processing is split into several stages – for example, there might be a request for authentication and a separate request for account check (HBAC). It’s not beneficial to contact the server separately for both requests, therefore we set a very short timeout for the PAM responder during which the requests will be answered from in-memory cache. The default value of 5 seconds might not be enough in cases where complex group memberships are populated on server and client side. The recommended value of this option is as long as a single un-cached login takes. In case the Kerberos ticket has a PAC blob attached to it (see above) and password authentication is used, the krb5_child processes the PAC blob to help establish the group memberships. This processing might take longer than the time the krb5_child process is allowed to run. Therefore, for environments where users are members of a large number of groups, the krb5_auth_timeout value should be increased to allow the groups to be processed. In future SSSD versions, we aim at making the processing much faster, so the default 6 seconds timeout would suffice. Contacting the PAC responder can also be avoided completely by disabling the krb5_validate option, however disabling that option has security implications as we can’t any longer verify the TGT has not been spoofed with a MITM attack. Please see the server side section. On the client side, there is an additional caveat – the risk the client would reboot and then lose connectivity to the server is higher. Please do not set this option on roaming clients where you rely on offline logins! # Disabling the validation is dangerous!! Don’t forget to restart the SSSD instance for the new settings to take effect!